Blogging is possibly one of the best hobbies I ever started. I have made so many connections, improved my writing skills and found my passion and career goal. 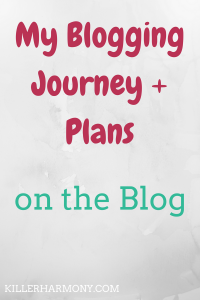 These last few years have been amazing, and I am going to share a bit about my blogging journey with you. I hope this post inspires you whether you have been blogging for years, just started in the last week or you simply love reading blogs. Through blogging, I have learned a lot, and it only makes sense to start at the beginning. In the fall of my freshman year of college, I decided that I wanted to share my life as a music major with people. I considered a YouTube channel, but I didn’t want to learn how to edit videos. Writing was something I was already pretty good at. I knew I would enjoy it. My first blog was on Blogger; it was pretty simple. I was able to write and share posts. But I didn’t really know what I was doing. I barely edited my posts, didn’t share them on social media at all and I didn’t add any images. I eventually closed that blog down and started another, more general blog. That blog would be called It’s Mixed Arts. I had used that name before as a sort of brand name. I loved all sorts of art things, so I thought it would work. Music, theatre and writing could all fit under one topic. In the fall of 2015, a full two years after starting my first blog, at learned about the blogging community. I found Facebook groups, blogs about blogging and met other bloggers. I was able to connect with people who were doing the same thing as me. Before finding those other bloggers, I didn’t talk to anyone about my blog. Not even my family or close friends. Connecting with those other people gave me the courage to start talking about my blog and sharing it on social media. When I told people about my blog, reactions were a bit mixed. Some people thought it was cool, but people like my parents didn’t really understand it. What was the purpose of writing stuff and sharing it? I loved it enough to continue, though. Around a year ago, I started to get serious about blogging. I attempted to sign up for hosting and to move my blog over to WordPress, but the price was a little high. I found a “great” deal from BlueHost that would only apply if I paid for three years in full. As a college student, I didn’t have that kind of cash. Instead, I stuck with Blogger, but I bought a domain name. Before buying, I considered changing the name. It’s Mixed Arts sounded a lot like mixed martial arts. That’s what would come up if I searched for my blog. I thought about my name, but would anyone really remember how to say or spell my last name Haefele? So, I went with Killer Harmony. I chose Harmony to be the basis of the name, because I was still writing about some music stuff. I went with Killer, because it was synonymous to words like cool or beautiful, but it was more badass. At the end of June, I had some time (and money) to consider self hosting again. I had by then heard of SiteGround. They had a much better reputation than BlueHost, and they didn’t require three years of payment upfront. I also had some time to learn WordPress, since my summer classes were over. Learning how to use WordPress didn’t take me that long, because I a man already pretty tech-savvy. My only regret, as cliche as it is, is not switching sooner. I have a lot of plans in the works for this blog (and my budding biz) for 2017. I will be posting more often, sending out regular emails and releasing products and services that will inspire or help you in some way. Have you started a blog? What did you gain from it? Let me know in the comments. Also, be sure to read my latest post and follow me on Twitter (@HannahHaefele) so you don’t miss future updates! Get a goal planning page!